Browse: Home / 2010 / December / 30 / Injured In A Car Accident? Do I Have a Claim? If you live in San Francisco Bay Area you can find many personal injury attorneys. However you must be careful who you choose to represent you and who you choose to treat your soft tissue injuries after a car accident. Bay Area Injury Centers work closely with few very reputable attorneys who can provide top quality service. The difference between our chiropractic offices is that we are always available on the phone, email, twitter, facebook or any other type of communication to answer any of your questions. Our personal injury attorneys that we work with are the same way. You will not be passed thru a gatekeeper and wait on the other line forever. Very well documented chiropractic rehabilitation is what will help you when you will ask a third party for pain and suffering reimbursement. A good Bay Area San Francisco Personal Injury Attorney will utilize great records for maximum recovery. An experienced San Francisco Bay Area injury lawyer can assist you in filing a claim against the responsible third party. The objective is ensuring that the cost required to treat your injuries is covered. Just remember one thing do not admit your guilt right away, only when you consult Personal Injury attorney and he/she will decide whose fault it was and what is the best course of action for your case. Try to document on paper or on your mobile phone as much information as possible. Most of the mobile phone have photo camera and video recording capabilities. Use your device to make all necessary pictures of the damaged vehicle and type pad to record all of the important information. Try to avoid talking to a third party. Make sure that you complete your treatment and rehabilitate your injuries. You can submit all of your records to a Personal Injury Lawyer of your choice or the one we recommend to you. Head-on collisions often result in serious soft tissue injury. 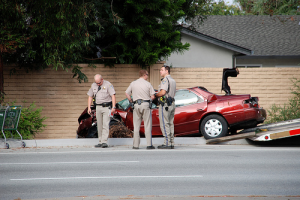 These types of accidents usually involve two vehicles that have collided with each other. Rear-end collisions, which often occurs when the other vehicle failed to slow down ot time or failed to stop completely. The car accident could have been caused by the use of a cell phone, and or distraction of some sort. Whiplash injuries are the most common of injuries in rear-end collisions. Side-impact auto collisions also known as “T-bone collisions” or “broadside collisions” often leave accident victims with serious soft tissue injuries and can turn fatal from time to time. Side-impact accidents often occur in rural areas and at intersections that have no stoplights or signs. Watch out when you are outside of the metropolitan area. Multi-car collisions are another example of a domino effect that has turned deadly. This type of accident is step often caused by multiple vehicles that impact each other and then spiral into other vehicles around them. Driver distraction, weather conditions, road rage all has been known to be the catalyst to such accidents. Rollover accidents involving vehicle rollovers are most likely to produce catastrophic or even fatal injuries. Such accidents often occur with SUV’s. SUVs rollover accidents have occurred due to sharp turns or abrupt maneuvers, causing the vehicle to roll over or lose control and crash. I hope you got some useful information out of this post. Starting your therapy after car accident and hiring a reputable personal injury attorney is very important for your faster recovery and compensation. If you are injured in Greater San Francisco Bay Area feel free to CONTACT us. Feel free to contact us even if you were involved in Car Accident anywhere in California. We are always happy to provide an advice.